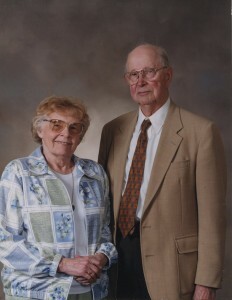 Chester Johnson, pictured with his wife Marian. Chester O. Johnson, a professor emeritus of geology at Gustavus Adolphus College, died Tuesday evening. He was 96. A founder of the College’s geology department, Johnson taught at Gustavus from 1940 until 1978. Following his retirement from teaching, Johnson continued to work at the College as an archivist in the Folke Bernadotte Memorial Library. In 1978, he became the Minnesota Synod Archivist of the Lutheran Church in America. In 1988, when the ELCA was created, he assumed the position of Lutheran Church Collection Archivist until his retirement in 2001. Johnson influenced many Gustavus students during his 61 years of service to the College and the Church, including Walter Youngquist ’42, who established two endowments at the College in honor of Johnson. The Chester O. Johnson Geology Scholarship and the Chester O. Johnson and Walter L. Youngquist Geology Student Research/Field Studies Fund were created in 2001. Johnson was born in Moline, Ill., on Feb. 1, 1913. He attended Augustana College in Rock Island, Ill., where he earned an undergraduate degree in English in 1935. He went on to earn his Master’s of Science degree from the University of Chicago. He eventually married Marian Swanson and had two children, a daughter Christine, and a son Martin. During his time at Gustavus he was active in the American Association for the Advancement of Science, the Geological Society of America, the American Association of Petroleum Geologists, the American Quaternary Association, the Minnesota Academy of Science, the National Association of Geology Teachers, and the Society of Economic Paleontologists and Mineralogists. Johnson was also co-author of the U.S. Geology Survey of Oil and Gas Investigation, the Oil and Gas Investigation Charts, and the Wyoming Geological Survey Bulletin. Johnson was also recognized by the Gustavus Adolphus College Association of Congregations with its Covenant Award in 2002. The Covenant Award is given annually to an individual who has made outstanding contributions in building and maintaining the relationship of Gustavus with the Lutheran Church. Services for Johnson will be held at 10 a.m. Saturday, Dec. 19, at Trinity Lutheran Church in St. Peter. Visitation will be held from 4-6 p.m. Friday, Dec. 18, at St. Peter Funeral Home Klein Chapel, St. Peter, and one hour before services at Trinity Lutheran Church. An excellent teacher with a way of teaching and interacting with his students that made geology come alive. He was so kind and friendly. When my Dad and Mom arrived from California in the Spring of 1957 to pick me up after my freshman year, Professor Johnson personally took my Dad, who was a desert rockhound at heart, and showed him throughout the geology lab. He even presented my Dad with a special book on Minnesota geology. That small gift and Prof. Johnson’s personal kindness, endeared my family even more to him and his teachings. As I sit here, now, reflecting on the meeting of those two men, here was a learned professor who took time to personally meet and talk with my father who had just arrived from California and had never been in Minnesota before in his life. My Dad was a simple man with only a basic education, but he treasured that meeting with Professor Johnson and his gift of an old textbook. Thank you, Professor Johnson, for being so kind to my family and me. We are all better for knowing and learning from you. God Bless you. I remember Chester from my student days working with the Public Affairs office and helping out with the GACAC conference. Truly sad to hear of his passing. A great loss for the college and the ELCA — his institutional knowledge was amazing. My condolences to his family. Chester Johnson was my all-time favorite teacher. He was the first teacher I ever had who could say the words: “That I do not know.” It was refreshing to hear a teacher admit that they did not know everything and it was all right to say so. I will miss his gentle humor.